Firefox web browser has a feature that provides great convenient to users, that’s Password Manager (now known as Saved Logins) feature that saves passwords. Firefox can save the user names and passwords credentials that users enter on a website, remembers the security details and then automatically fill (autofill) in the user name and password whenever users visit the particular website that requires login. However, the stored and saved password is not secure and safe in Firefox web browser. Any administrators, or anybody that able to log on to your Windows user account, or use your computer when you leave the computer on while away for a while can easily see what’s your passwords set for all saved websites. Firefox’s Saved Logins (previously known as Password Manager) allows saved password to be displayed and viewed by going to Tools menu, then Options, and then go to Security tab. From there, user can hit the Saved Logins -> Show Passwords to display all the passwords saved. Previously, the process is even easier by just clicking on Show Passwords button twice. In Firefox, click on Menu icon (three horizontal line) or Tools. Under the “Logins” or “Passwords” section, tick the check box for Use a master password. 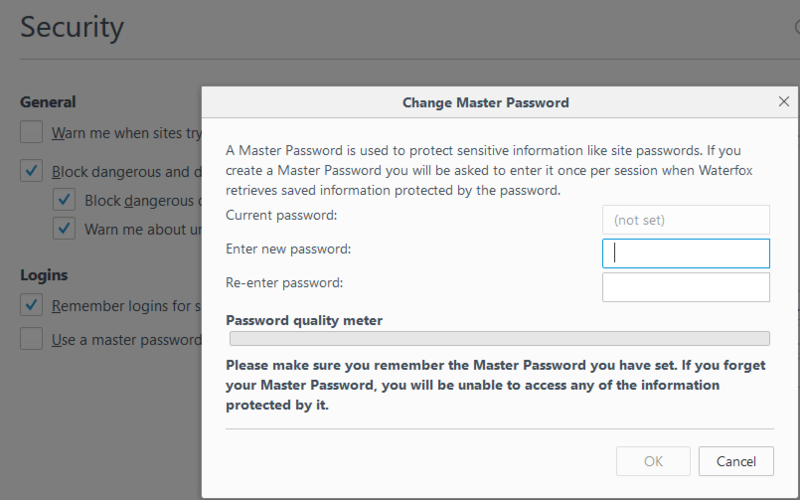 If you have never set a master password before, a “Change Master Password” box will appear. Enter and re-enter the new password you want to use as master password. Then, click on “OK”. If you have set a master password before and want to change the password, click on Change Master Password. Remember that you must remember the master password after enable the the protection to secure the saved password. If the master password is lost or forgotten, you will have a hard time to recover the master password and unable to view the saved password anymore.